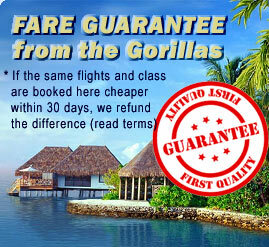 At AirGorilla we try to provide you an easy to use travel booking system and great flight schedules at good prices. But my oh my, listen to the story of this young newlywed couple (no, they did not book on AirGorilla). They had the honeymoon from hell, perhaps you might say. Stefan and Erika Svanstrom of Stockholm got married in November 2010. During their first flight, heading to Munich, a blizzard dubbed the "storm of the century" hit Germany, stranding the young couple at the airport. When they finally arrived in Bali, torrential monsoon rains greeted them. In January they moved on to Perth, Australia. The area was struck by tremendous bush fires after they landed. So they headed to Cairns, only to endure the wrath of Cyclone Yasi, one of the worst cyclones (hurricanes) to ever hit queensland state. They were evacuated into a shopping center, where they had to shelter with 2,500 other storm victims on a concrete floor for 24 hours. When they came to Brisbane, down the coast, there was the worst flooding in city history. Then they flew to Christchurch, New Zealand, just hours after much of the city was leveled by a large earthquake. "The whole town was like a war zone," reported Mrs. Svanstrom. Later, they landed in Japan (they had scheduled quite an itinerary, evidently). But the Asian tsunami and nuclear disaster then hit Japan just two days later while they were in the country. They saw roof tiles fly off buildings. At least at their final travel destination in China, their experience was trouble-free. One might guess that if they made it through all this drama, they are due for a long and successful marriage. We wish them good luck along the way. (Source: F. Times issue 277, page 11, August 2011). What a trip? This gull is not impressed with larger predatory birds such as this eagle. As noted by NewScientist.com, "Herring gulls dive-bomb predatory birds at a steep angle from above and behind, as they make a piercing shriek - "kaiow!". Pat Monaghan, a professor of animal ecology at the University of Glasgow in the UK, "It's often suggested that using birds of prey, flown by falconers, might act as a gull deterrent. ... This picture suggests otherwise." Be careful to renew passports far in advance! Don't let your passport get in the way of your travel overseas! The U.S. Department of State recomments renewing your passport at least nine months before your passport expires. You can do this by mail if your current passport was issued on or after you turned age 16, your legal name has not changed, and your passport is not damaged. You would use Form DS-82 to renew by mail. The post office and the US Dept. of State's web site have this form. You need to produce new passport photos to send in with your application - 2" X 2" size with good lighting, white background, and a clear focus. Place a stable at each corner of the photo. Place the completed DS-82 with attached passport photos, passport fees, and any additional documentation that is needed into an envelope (Tyvek brand is recommended). For more specific details see the travel tips web site. If you cannot renew via mail, the schedule an appointment for yourself at any regional passport agency. Certainly flying cars have been a popular image of "the future" since at least the 1950's. In the past few decades a number of inventors have worked on a variety of models. Some look more like cars, while others look more like airplanes. The latter is the case with the latest and greatest, produced by Burt Rutan. See link flying cars. His latest vehicle, the "BiPod," has two fuselages, so its a bit antisocial for passengers as you can see. Rutan is the founder of Scaled Composites, the Mojave, California-based maker of record breaking planes. Thus he decided also to design and build his own "roadable aircraft" - a car that can be converted into a plane. Meanwhile, another company, MIT spinoff Terrafugia, has won road approval for Transition, another "roadable aircraft." The EU has in fact pumped 4.3 million Euros into developing new collision avoidance technology which certainly would be critical if such personal aircraft are to take to the air in meaningful numbers. Travel to Jordan for Star Trek? Assuming the Middle East is less hostile in 2014, a sci-fi fan might wish to visit the nation of Jordan. It is going to be a while, but in that year The Red Sea Astrarium project will be completed in Aqaba, the main seaport of the nation of Jordan in the Middle East. A highly featured attraction of the park will be a “space-flight-adventure” that is designed to match Star Trek. Per Time.com, developers have promised to “deliver a variety of multi-sensory futuristic experiences, culminating with a state-of-the art space-flight adventure that takes real-time immersive entertainment experiences to bold new heights." Where did this idea come from? Well, Jordan's King Abdullah II is a devoted Star Trek fan and it is even said that he had a cameo in a 1995 episode of Star Trek: Voyager. Given how far travel to Jordan is would be for most of our blog readers, it sure would be nice if "beam me up" technology would come to fruition sooner rather than later. Using DNA analysis, the Connecticut Department of Energy and Environmental Protection has discovered that a 140-pound mountain lion killed on the the Wilbur Cross Parkway in Milford, Connecticut, in June had traveled greater than 1,500 miles from South Dakota. It had been seen earlier in June in Greenwich, CT, as well. "The confirmation of a wild mountain lion in our state was the first recorded in more than 100 years," said Daniel Esty, commissioner of the department. As stated in their press release, "DNA tests show that tissue from the Milford mountain lion matches the genetic structure of the mountain lion population in the Black Hills region of South Dakota." This is certainly rare behavior on acccount of a mountain lion. At least a half dozen confirmed sightings of a mountain lion in Minnesota, Wisconsin and Michigan are believed to be of the same animal. Where is it too hot to travel? Well, all the usual places are too hot right now for travel of course, especially Texas and the southern Plains. But would you find any relief in, say, Siberia? Umm, no. The forecast is 99 degrees today, and 100 tomorrow, in Yakutsk, one of the hubs of Siberian commerce and governance. It has been 95 the past several days as well. Yakutsk is not far from Ojmjakon, which holds the record for cold in Siberia in the minus 90's. Is Spirit Airlines nuts? Mad as a hatter? As reported by Travelmole, Spirit Airlines is again the first to add a fee for the most silly thing. Spirit Airlines has announced it will charge $5 for passengers who ask a counter agent to print out a boarding pass for them at the airport. What next? Will they charge everytime you show them your photo ID during check-in (an eyeball analysis fee?!) In related news, Spirit Airlines (and Allegiant Air) is suing the US Department of Transportation over the DOT's heavy-handed regulation of airlines and travel agencies with regard to the display and disclosure of all ancillary fees during the purchase process. Given Spirit Airlines' heavy-handed issuance of unprecedented fees on carry-on baggage and numerous other things formerly taken for granted by passengers, over the past year or two, it is perhaps unsurprising they would be worried about having to be "up front" about these fees. Meanwhile, passengers have to wonder what exactly does a base ticket cost cover? Americans and other tourists visiting Austria in Europe occasionally wonder where the kangaroos are! It is common to mistake Austria for Australia in common conversation. There are signs and T-shirts in Austria meant to correct the misperceptions of travellers, saying "No kangaroos in Austria." However, in mid-August this past year, Austrians in the southern town of Preding have witnessed a kangaroo bounding around the countryside. The five-year-old had escaped two months earlier from a private zoo nearby. The kangaroo, named Sumsi, has eluded multiple attempts at capture. So apparently, there ARE kangaroos in Austria. Source: AP newswire, 19 Aug 2010. Escaped Australian animals, once held as pets, are actually not uncommon in Europe. Reports of escaped wallabies are common in Britain. And an albino wallaby was recently sighted in Netherlands. Scotland has a colony of some 60 wallabies living on an island in Loch Lomond. (Source: Fortean Times 274 in 2011). Large Gorilla on Is Spirit Airlines nuts? Mad as a hatter? David Kamatoy on Check out Tim Leffel's Blog on, "Practical Travel Gear"
AirGorilla on Speak softly and save BIG!